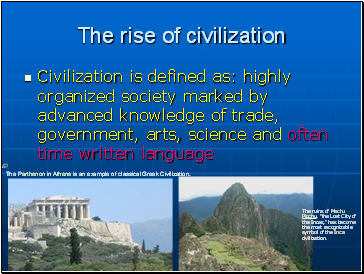 The first people of the world, did they live in societies? Were there Wal-marts for the first people? 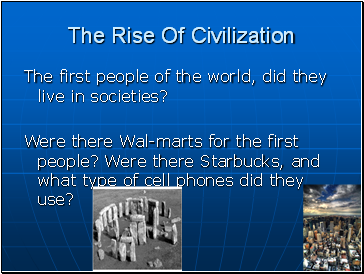 Were there Starbucks, and what type of cell phones did they use? The Parthenon in Athens is an example of classical Greek Civilization. The ruins of Machu Picchu, "the Lost City of the Incas," has become the most recognizable symbol of the Inca civilization. 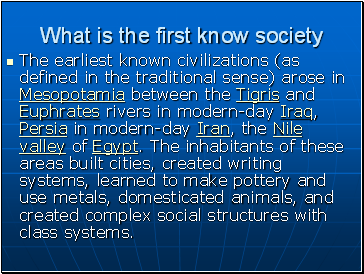 The earliest known civilizations (as defined in the traditional sense) arose in Mesopotamia between the Tigris and Euphrates rivers in modern-day Iraq, Persia in modern-day Iran, the Nile valley of Egypt. 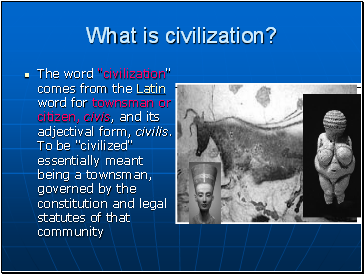 The inhabitants of these areas built cities, created writing systems, learned to make pottery and use metals, domesticated animals, and created complex social structures with class systems. Its name means 'Lesser Asia'. 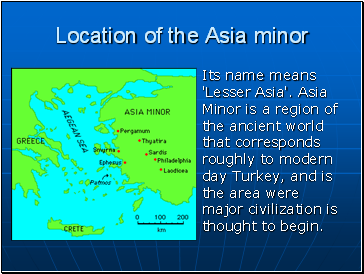 Asia Minor is a region of the ancient world that corresponds roughly to modern day Turkey, and is the area were major civilization is thought to begin. 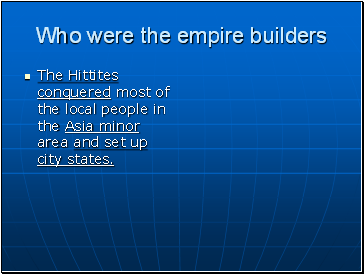 The Hittites conquered most of the local people in the Asia minor area and set up city states.